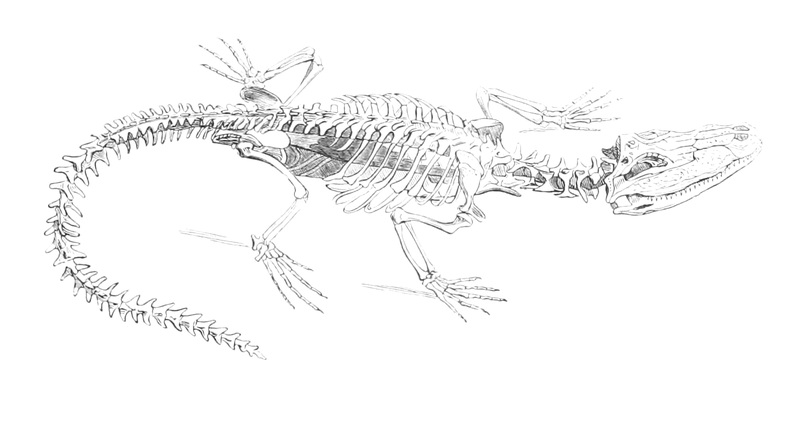 As Halloween approaches, I thought it would be fun to share with you a skeleton of a different sort – a caiman skeleton. However, if you need a great science image, it should work for that too. Caimans are reptiles that are similar to alligators and crocodiles – the big lizards. But, there’s nothing left of this poor fellow but his bones. He graced the pages of a natural history encyclopedia published in France in 1856. The work was one of many by the noted physician and naturist Jean-Charles Chenu (1808-1879). Is it just me, or does this skeleton almost look cute? The lines around his eye bones look like eyelashes. And, without the scaly skin, the teeth seem somehow less threatening and more of a sweet smile. I think this way, he looks a bit more dragon and a whole lot less man-eating lizard. OK, so maybe I’ve already raided the candy bowl. Anyway, like so many of Chenu’s great drawings and illustrations, this one was available in a fairly large size. If you plan on adding him to your projects, make sure you click on him to retrieve the largest image we have. P.S. If you would rather have a caiman drawing that isn’t Halloween worthy, check out Chenu’s vintage caiman drawing.